Fossils are hard and usually brittle, so they must first be stabilized in a tough resin. Epoxy or polyester resins are the common ones used in palaeohisto labs. They tend to be two-part mixtures that are mixed up first and then poured over the specimen in a container that won’t react with the resin. As soon as the specimen is submerged in resin, it must be vacuumed. Most fossils are filled with tiny air pockets that will interfere with the later processes if they are not filled in with resin. 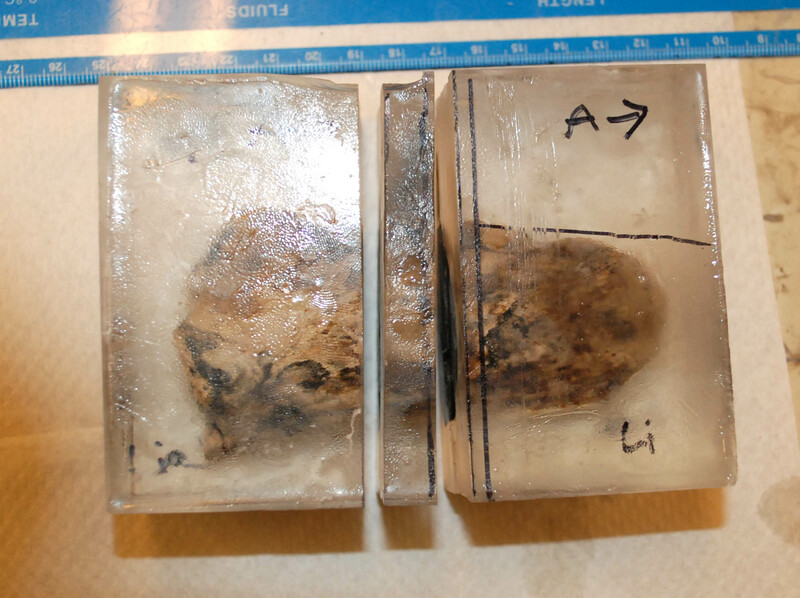 The vacuum process takes care of this and helps the resin permeate through the fossil. A partial lower jaw of an alligator embedded in resin. 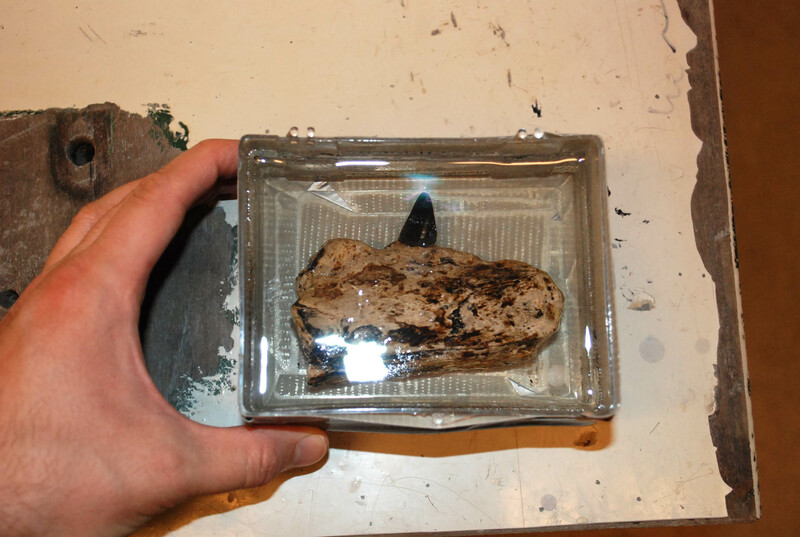 A pair of mosasaur teeth embedded in a resin block. Now that they’re stabilized in resin, they can be cut. After the resin has hardened, it’s time to make the first cut. Precision is key, so keeping the surface of the resin clear is important. I usually draw lines on the surface of the resin using a straight-edge to help guide my cuts on the saw. The lab at the Royal Ontario Museum has a wafer blade, low-speed saw that is diamond encrusted…perfect for cutting through fossil bones and teeth! Unlike a conventional table saw, the wafer blade is not serrated. The saw slowly grinds through the specimen with minimal loss of material (the blade is so thin that you can bend it with your hands…although I don’t recommend doing this). After you have made your first cut(s) through the specimen, the cut surfaces that you plan to mount to slides must be ground smooth. We do this by hand, using progressively finer grits of a tough silicon carbide powder suspension against a glass plate. This process sands the surface down nice and even so that it will stick nicely to a slide. A pair of mosasaur teeth (embedded in resin first, of course) being cut on a precision saw called an Isomet. The blade is extremely thin so that there’s minimal loss of material from the cut. The alligator jaw after the first two cuts with the low-speed saw. As they say in construction: measure twice, cut once! After the cut surface is smooth and dry, it is time to glue the specimen to a slide. I started using glass slides for studying fossil teeth and learned rather quickly that, for whatever reason, glass and fossil teeth don’t always get along. I have since switched to plexiglass slides in our lab, because they seem to hold much better. Some labs use epoxy to glue specimens to the slides, whereas others use a type of superglue. I use superglue, because it sets quickly and also melts a bit of the plexiglass slide as it sets, which makes for a surprisingly strong hold. For big specimens, though, I’d recommend epoxy. Mounting the specimen to the slide should be done slowly and with the goal of having the least amount of air bubbles trapped on the slide as possible. This part takes practice. Once the adhesive sets, the slide is mounted to the low-speed saw again and the remainder of the block is cut, so that only a thin wafer is left attached to the slide. A mosasaur tooth that has been cut on the isomet saw and now mounted to a plexiglass slide. Once the glue has set, the slide is mounted to the precision saw once more (this time with a special slide holder) and the block is cut off of the slide, leaving a thin wafer mounted to it. Now that there is only a thin wafer left on the slide, it can be ground down to the desired thickness. The hardest part is knowing how thin to grind the specimen. We use a machine grinder to do most of the grinding and get the mounted wafer thin enough that light passes through it. The rest of the grinding is done by hand using finer and finer grits of that silicon carbide powder. When do you know it’s done? How thick is too thick? How do I grind evenly by hand? These are all things that just come with practice and a bit of patience. My strategy: check the slide very often under a microscope until you can see clearly what you wanted to see. Looking at enamel, dentine, bone, or cementum may require several slides at different thicknesses to get the whole picture. The slide is passed back and forth past a rotating grinding cup on the Hillquist. The rest of the process is done by hand using a glass plate and finer and finer grits of a grinding powder. This part takes practice to get the slide to just the right thickness. 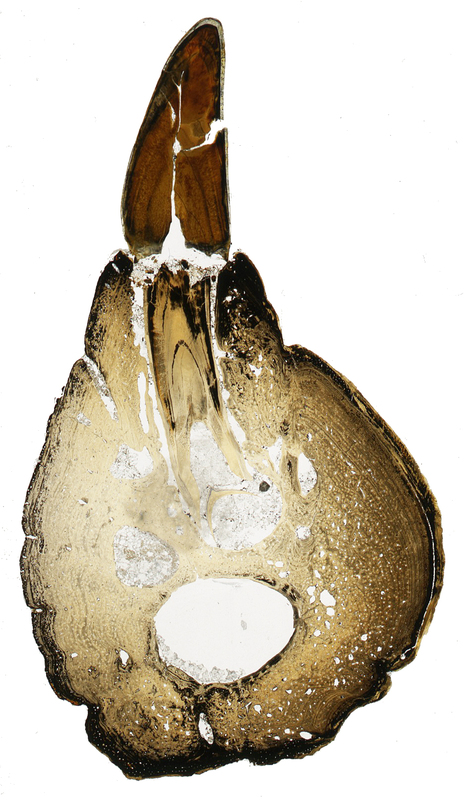 Thin section through the lower jaw of a large alligator. Note that the bone is much lighter than the tooth. This is due to differences in the two tissues, but also to slightly uneven hand grinding. The bigger the specimen, the harder it is to grind evenly.